With 17 stations between downtown San Jose and Auburn in the Sierra foothills, the Capitol Corridor train route offers serious cyclists in Northern California access to some of the best cycling in the state. All of the Capitol Corridor trains accommodate bicycles, making it easy to get out for a road bike trip through wine country, alongside babbling creeks, up through hills, and beyond. Part I of this series offered five suggestions for rides that are easily accessible from our train stations. Here are four more fun and adventure-filled rides between Fremont and Fairfield. The climb up Mount Diablo is a tough one, but you’ll be rewarded with views of the hillsides and even the San Francisco Bay on clear days. Photo by John Morgan. As the devilish name suggests, this is a tough loop that will test your mettle. After exiting the city streets, it’s a 22-mile climb to the summit, followed by a thrilling descent. Cyclists love this route for the twisting turns, varied landscapes, and sheer endurance needed to ride it all. 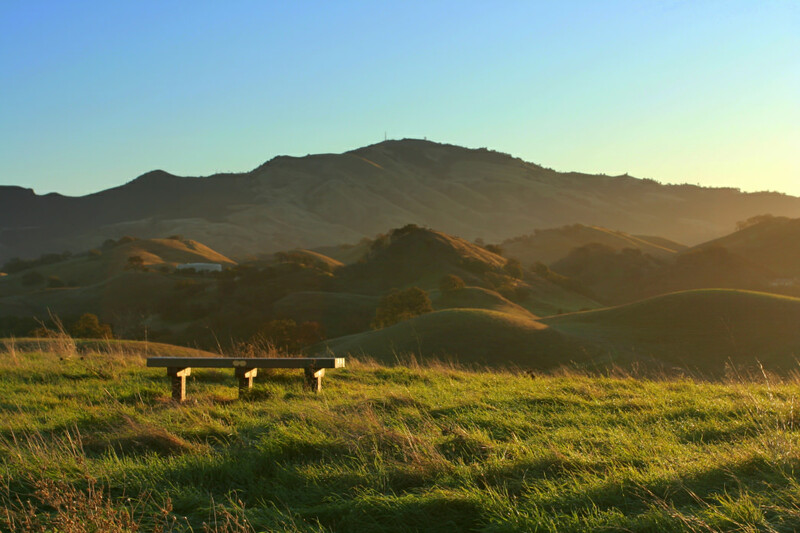 Stop at the observation deck once you get to the summit of Mount Diablo; you’ll be treated with expansive views of the surrounding hillsides. San Francisco Bay is visible in the distance if the weather is cooperating. Details: From the Berkeley Station, make your way on city streets to Domingo Avenue and El Camino Real. Climb up El Camino to Tunnel Road, to Skyline Boulevard and past the Sibley Volcanic Regional Preserve. Continue straight onto Pinehurst Road, then left on Canyon Road toward Moraga, taking St. Mary’s Road past the Lafayette Community Center. Find your way to Reliez Station Road, then turn right on Olympic Boulevard. Take a right on Tice Valley Boulevard, then head south on Danville Boulevard, and turn left on Stone Valley Road. Go right on Green Valley Road, then left on Diablo Road. Turn left up the Mount Diablo Scenic Boulevard and continue about 10 miles to the summit. (Mount Diablo Scenic Boulevard will turn into South Gate Road and then Summit Road along the way). For the descent, go down North Gate Road to Walnut Creek. From there, cut south on Homestead Avenue and back to Olympic Boulevard. Ride along the north side of Orinda along Happy Valley Road, then through Tilden Regional Park on Wildcat Canyon Road. Go down Euclid Avenue all the way back to UC Berkeley, taking University Avenue back to the Berkeley Station. Alameda Creek Regional Trail is perfect if you’re looking for a flat route with wildlife viewing opportunities. Photo by Amy Meredith. The Alameda Creek Regional Trail is an easy, mostly flat ride along a creek with no auto traffic and plenty of bird watching opportunities. Riders will pass Coyote Hills Regional Park and the Quarry Lakes Regional Recreation Area on this loop; both were once home to Native Americans who inhabited the region. The trail on the south side of the creek is paved. While the north side of the trail is unpaved, the hard-packed surface makes it easily passable by bike. Multiple rest stops along the trail offer restrooms and water. Details: From the Fremont/Centerville Station, it’s 1.5 miles to the trail. Take Thornton Avenue north, then left on Paseo Padre Parkway to Isherwood Way, which intersects with the trail on your right (to the north). You’ll join the 12-mile trail at roughly the 3.5-mile mark. You can ride clockwise or counterclockwise. You’ll likely run into other riders in the small town of Sunol, a popular pit stop. Photo by Don DeBold. This solid training ride circles Fremont, Milpitas, and San Jose. Cyclists will ascend past the Calaveras Reservoir and alongside grassy hillsides decorated with quintessential California chaparral. The small town of Sunol offers a popular pit stop where many riders load up on snacks and drinks before continuing on. The descent along Sierra Road is notoriously steep and twisty, though that doesn’t stop cyclists from reversing the ride and pushing up the demanding climb. Details: From the Fremont/Centerville Station, take Peralta Boulevard northeast, finding your way to the start of the Alameda Creek Trail and Niles Junction. Climb east up Niles Boulevard, through the canyon, past Sunol. Then take Calaveras Road south, starting a slow climb to the Sunol Regional Wilderness. Continue past the reservoir. At the dead end, turn left on Felter Road, straight onto Sierra Road, then right on Piedmont Avenue as you enter Milpitas. Head north, following Evans Road, along North Park Victoria Drive, crossing Interstate 680 at Scott Creek Road. Continue north on Warm Springs Boulevard. Follow East Warren Avenue to Mission Boulevard for 8 miles back to Niles Junction, then back to the station. 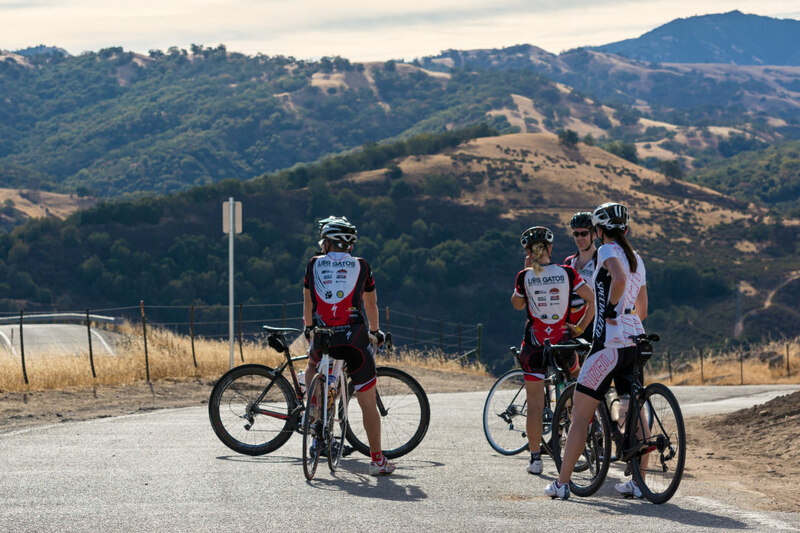 If you’re looking to ride through wine country, try the Solano Loop. Photo by Tom Hilton. 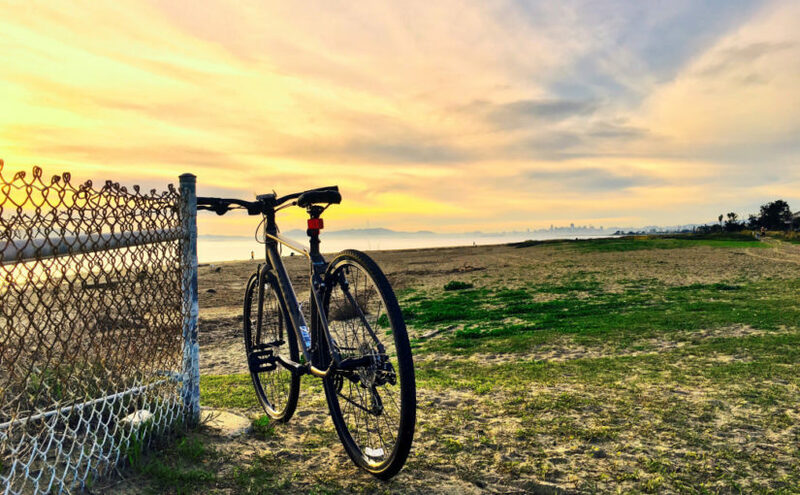 This cycling route in Solano County pairs beautifully with a train ride, dropping riders off at a bike trail that connects with the loop. Exit the town of Fairfield and go north into Napa County to ride through Wooden Valley. 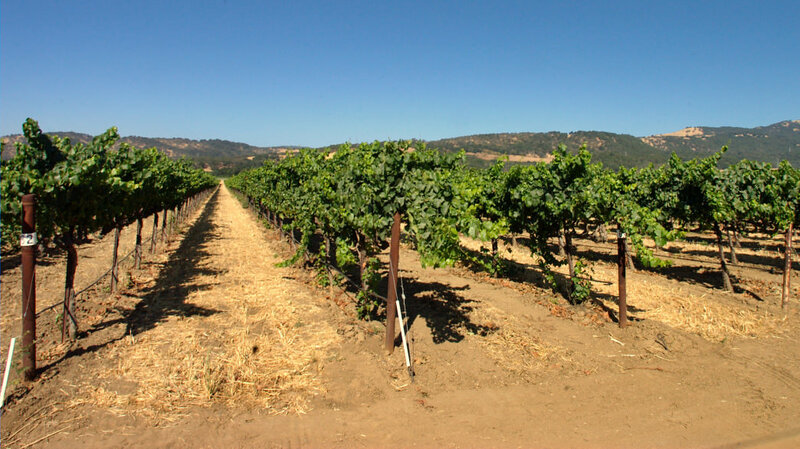 This dreamy landscape offers scenic wine country views interspersed with grassy hills, picturesque California oaks, and rolling farmland. The stretch from Gordon Valley Road up past Lake Berryessa and down into Pleasants Valley Road with the slight detour for some last hills via Cantelow Road is an idyllic road biking destination, thanks to the peaceful vineyards, smooth asphalt, and oak canopies (just watch for the traffic). Riding either direction is a pleasure (we show the clockwise route) and just remember to ride early to avoid some of the afternoon boating traffic near Lake Berryessa but expect the west wind that blows harder during most afternoons once you leave the shelter of the hills. Be sure to take plenty of water, but there is a key re-hydration opportunity at Lake Solano County Park near the intersection of SR 128 and Pleasants Valley Road. Details: From the Suisun/Fairfield Station, take the bike/ped bridge over the railroad tracks. Turn sharp left onto Union Avenue, which forces you right onto Ohio Street. In a block, turn right toward Webster Street, which you then take north to Texas Street, and that becomes West Texas Street and right as you cross under Highway 80 it becomes Rockville Road. At the traffic circle, take the first right onto Abernathy Road and follow that as it eventually becomes Mankas Corner Road. At what looks like the official Mankas Corner (a great place to fuel up or take a relaxing break either way on the loop), turn right briefly onto Clayton Road followed by a quick left onto Gordon Valley Road. Where it looks like the main road goes to the left, Wooden Valley Cross Road begins just as Gordon Valley Road veers off. Wooden Valley Cross Road intersects Wooden Valley Road where you turn right out of this beautiful valley and onto picturesque SR 121 followed after by a right on SR 128. 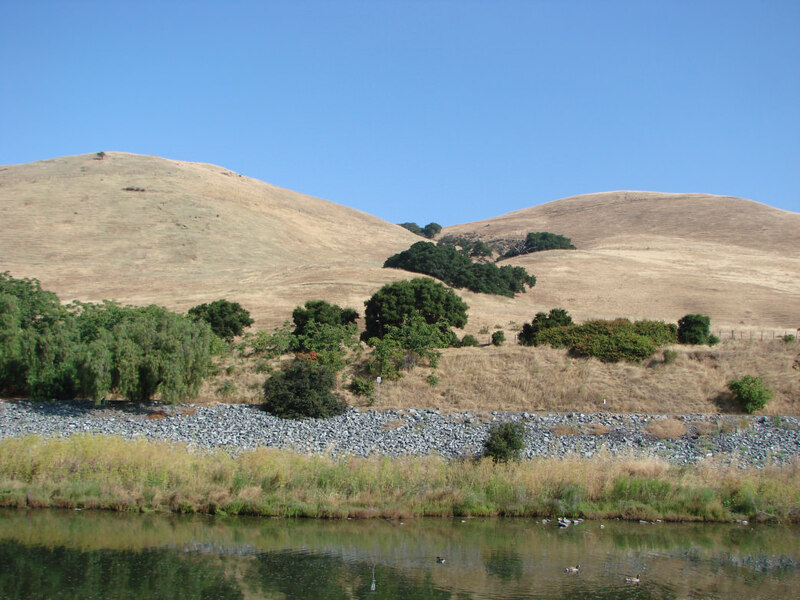 Be mindful of vehicles trailing boats as Lake Berryessa access is along this hilly and scenic portion of the route. At Pleasants Valley Road, turn right (perhaps with a water stop at Lake Solano County Park) following this popular bike road until you hit Cantelow Road. Climb up and over on Cantelow Road until you turn right on Gibson Canyon Road. Next, turn right at Farrell Road which becomes Vaca Valley Road. Turn left as you again hit Pleasants Valley Road. At the dead end of Pleasants Valley Road, turn right onto Cherry Glen Road and follow it as it crosses over Highway 80. Make a right on Nelson Road, which acts like a bike-only frontage road to Highway 80, and as it ends, find a bike path to your left and take that path until it spills right onto Paradise Valley Drive, which becomes Dover Avenue. Stay on Dover until East Tabor Avenue and turn left. Then turn right on Sunset Avenue and stay on it crossing over the railroad tracks until you turn right on Railroad Avenue. Where Railroad Avenue terminates, turn left onto Marina Boulevard. Just before you get to SR 12, turn right onto the bike path that leads you back to the Suisun Station. Featured image provided by Jeff Gloriana.